This is the first of a two-part series in NWABR's bioinformatics curriculum, funded by a grant called Bio-ITEST: New Frontiers in Bioinformatics and Computational Biology, an Innovative Technology Experiences for Students and Teachers (ITEST) award from the National Science Foundation (NSF). This three-year award provided funding for education outreach programs and curriculum development that help secondary school teachers and their students learn about how information technology is used in biological research. The Introductory curriculum unit explores how bioinformatics is applied to genetic testing. Specifically, the bioinformatics tools of BLAST and Cn3D are used to investigate the genetic and molecular consequences of a mutation to the Breast Cancer Susceptibility 1 (BRCA1) gene. Students are also introduced to principles-based bioethics in order to support their thoughtful consideration of the many social and ethical implications of genetic testing. Throughout the unit, students are presented with a number of career options in which the tools of bioinformatics are used. In order for us to measure how our curriculum resources are being used, please take a moment to contact us and let us know the class or classes in which you're using our lessons. We also welcome feedback about our introductory bioinformatics curriculum. We will not share your contact information with anyone. The curriculum unit explores how bioinformatics is applied to genetic testing. Specifically, the bioinformatics tools of BLAST and Cn3D are used to investigate the genetic and molecular consequences of a mutation to the Breast Cancer Susceptibility 1 (BRCA1) gene. Students are also introduced to principles-based bioethics in order to support their thoughtful consideration of the many social and ethical implications of genetic testing. Throughout the unit, students are presented with a number of career options in which the tools of bioinformatics are used. This PDF contains the entire “Using Bioinformatics: Genetic Testing” curriculum, including the overview, lessons, and appendix. For accompanying lesson PowerPoints, please download from the links above. In this lesson, students engage in a case study about a family with a history of breast cancer. Students consider ethical issues surrounding genetic testing as they decide whether or not family members should get tested for BRCA1 or BRCA2 mutations. Students then evaluate the case through the principles-based bioethics concepts of: Respect for Persons, Maximize Benefits/Minimize Harms, and Justice. Students apply the principles to help them reason through their decision as they participate in a Structured Academic Controversy. In Lesson Three, students learn how genetic counselors might use bioinformatics tools in their career. Students begin this lesson by working through a pedigree chart and Punnett squares for the Lawler family, attempting to track the BRCA1 mutation across generations. Based on the decisions as to who should be tested for the BRCA1 mutation, students then use the bioinformatics tool known as BLAST (Basic Local Alignment Search Tool) to compare individual DNA and protein sequences to reference sequences that are known to be free of BRCA1 mutations associated with cancer. At the end of the lesson, students compile class information from the Lawler family in order to revise their pedigree charts and Punnett squares. In Lesson Four, students learn how laboratory technicians might use bioinformatics tools in their career. Up to this point, students have seen the BRCA1 protein represented in a linear, sequential form. In this lesson, students are introduced to the high importance of a protein’s three-dimensional structure. Students first engage in a short activity in which they use a pipe cleaner to perform a simple function, as an analogy for the relationship between a protein’s structure and function. Students then learn to navigate between linear protein sequences and three-dimensional structures by using the bioinformatics tool Cn3D. Students begin by viewing and manipulating DNA—a familiar molecule to students—using Cn3D. When students are familiar with the program, students visualize parts of the BRCA1 protein to show how a specific mutation in the BRCA1 gene ultimately changes or destroys the protein’s function. 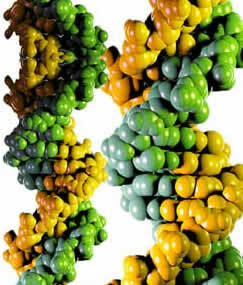 In Lesson Five, students learn how 3D animators might use bioinformatics tools in their career. In this lesson, students apply the ethical skills and scientific knowledge they have acquired over the previous lessons to determine (1) whether BRCA1 testing meets the standards of a useful genetic test, or (2) whether direct-to-consumer genetic testing should include genetic counseling of clients. Students or teachers may choose from one of two readings, after which students participate in a Socratic Seminar in order to deepen their understanding about genetic testing. Through the seminar discussion of the first reading, students become familiar with a framework for considering genetic tests in terms of their clinical validity and the availability of effective treatment. Through the seminar discussion of the second reading, students become familiar with issues and preliminary data regarding the effects of direct-to-consumer genome-wide screening. After the seminar, students are supported in coming to an individual position about genetic testing through the integration of scientific facts, stakeholder viewpoints, and ethical considerations. In Lesson Six, students learn how bioethicists might use bioinformatics tools in their career. As an assessment of the unit, students revisit some of the bioinformatics tools they have used in prior lessons in order to locate a mutation in a protein associated with a genetic condition. Students also evaluate current genetic tests for the condition using the criteria of clinical validity and treatment options. Two conditions and their tests are presented: porphyria and amyotrophic lateral sclerosis (ALS). PowerPoints to accompany each "Using Bioinformatics: Genetic Testing" lesson are found on "Lessons" page, besideeach lesson title. This Word document file contains Lawler family BRCA1 DNA and protein sequences. These Word documents contain DNA and protein sequences of a variety of fluorescent proteins, including eukaryotic Green Fluorescent Protein (eGFP), the mCherry Red Fluorescent Protein (RFP), the mLemon Yellow Fluorescent Protein (YFP), and other members of the "mFruits" such as mGrape1, and mTangerine 1.5. This extension was first developed during the 2013 "Workshop C: Cloning DNA to Make Protein," part of the three-part partnership series between NWABR and Shoreline Community College's Amgen Bruce Wallace Biotechnology Program, "Easy as ABC: Applications of Biotechnology in the Classroom." Authored by the Bio-ITEST team at NWABR. These structures can be used by teachers to illustrate the consequences of sickle cell mutations on the structure of hemoglobin. This extension was first developed during the 2012 "Workshop A: An Understanding of DNA: Making the Invisible Visible," part of the three-part partnership series between NWABR and Shoreline Community College's Amgen Bruce Wallace Program, "Easy as ABC: Applications of Biotechnology in the Classroom." Note: This is structure is the multimer of four hemoglobin monomers. Note: This is structure is the multimer of four sickle-type hemoglobin monomers. Note: This is an overlay of a single wild-type and a single sickle-type hemoglobin monomer. These structures can be used by teachers to illustrate the structural similarities between two unrelated fluorescent proteins: eukaryotic green fluorescent protein (eGFP) and red fluorescent protein (RFP). This activity can be used in conjunction with the fluorescent protein BLAST comparison activities developed as an extension of Lesson Four. This extension was first developed during the 2013 "Workshop C: Cloning DNA to Make Protein," part of the three-part partnership series between NWABR and Shoreline Community College's Amgen Bruce Wallace Biotechnology Program, "Easy as ABC: Applications of Biotechnology in the Classroom." Note: This is structure is a dimer of two GFP monomers. Note: This is structure is a RFP monomer. Note: This is an overlay of a GFP monomer and a single RFP monomer. This PDF contains the instructions for the Lesson Four extension activity, "Comparison of Fluorescent Proteins Using BLAST." The activity begins with a brief overview of the diversity and uses of fluorescent proteins in biological research, and then explains to students how to use the Introductory bioinformatics Lesson Four Student Handout, "Instructions for Aligning Sequences with BLAST," to compare sequences of flruoescent proteins. The goal is to determine whether the red fluorescent protein (RFP) included in the Amgen Bruce Wallace Biotechnology Laboratory Program is related to the famous GFP. This extension was first developed during the 2013 "Workshop C: Cloning DNA to Make Protein," part of the three-part partnership series between NWABR and Shoreline Community College's Amgen Bruce Wallace Biotechnology Program, "Easy as ABC: Applications of Biotechnology in the Classroom." This PowerPoint provides and overview of the Lesson Four extension activity using BLAST to compare fluorescent protein DNA and protein sequences. It includes a brief history of fluorescent proteins, their uses as biological tools, and an introduction to their diversity. This extension was first developed during the 2013 "Workshop C: Cloning DNA to Make Protein," part of the three-part partnership series between NWABR and Shoreline Community College's Amgen Bruce Wallace Biotechnology Program, "Easy as ABC: Applications of Biotechnology in the Classroom." This Word document contain DNA sequences of a variety of fluorescent proteins, including eukaryotic Green Fluorescent Protein (eGFP), the mCherry Red Fluorescent Protein (RFP), the mLemon Yellow Fluorescent Protein (YFP), and other members of the "mFruits" such as mGrape1, and mTangerine 1.5. This extension was first developed during the 2013 "Workshop C: Cloning DNA to Make Protein," part of the three-part partnership series between NWABR and Shoreline Community College's Amgen Bruce Wallace Biotechnology Program, "Easy as ABC: Applications of Biotechnology in the Classroom." This Word document contain protein sequences of a variety of fluorescent proteins, including eukaryotic Green Fluorescent Protein (eGFP), the mCherry Red Fluorescent Protein (RFP), the mLemon Yellow Fluorescent Protein (YFP), and other members of the "mFruits" such as mGrape1, and mTangerine 1.5. This extension was first developed during the 2013 "Workshop C: Cloning DNA to Make Protein," part of the three-part partnership series between NWABR and Shoreline Community College's Amgen Bruce Wallace Biotechnology Program, "Easy as ABC: Applications of Biotechnology in the Classroom." This Word document contains additional DNA and protein sequences of fluorescent proteins and their wild-type counterparts, to be used in extension BLAST analyses related to the above activities. The Personal Genome Project is a public genomics research study that aims to improve our understanding of genetic and environmental contributions to human traits. They are enrolling members of the public who are willing to share their genome sequence and other personal information such as health and medical data with the scientific community and the general public for purposes that promote human welfare through the advancement of scientific and medical discovery. The mission of the Personal Genome Project is to encourage the development of personal genomics technology and practices that: are effective, informative, and responsible; yield identifiable and improvable benefits at manageable levels of risk; and are broadly available for the good of the general public. To achieve this mission they are building a framework for prototyping and evaluating personal genomics technology and practices at increasing scales. Each year additional people are recruited to participate. A Series of articles written by Emily Singer for MIT's Technology Review detailing the rationale behind the Personal Genome Project, and how the project has grown tremendously during just the past few years. The home page of WBBA, the Washington Biotechnology and Biomedical Association (WBBA), provides information about biosciences in Washington State, as well as Education Materials such as a lab on gel electrophoresis and DNA fingerprinting. An informational site from the Council for Biotechnology Information. MedlinePlus: Latest news on stem cell research from the National Library of Medicine. PBS Newshour Online: Human Stem Cell Research: After reviewing background and a research interview on this controversial topic, view a three-minute animation on how human stem cells are cultured. Embryonic stem cell issues are debated by medical ethicists. NIDA provides easy-to-use powerpoint "Slide Teaching Packets" on several topics related to drugs and the brain, including: The Brain and the Actions of Cocaine, Opiates, and Marijuana, The Neurobiology of Drug Addiction, and the Neurobiology of Ecstasy (MDMA). NIDA and NIH also offer a free curriculum supplement called "The Brain: Understanding Neurobiology through the Study of Addiction." The Personal Genome Project is a public genomics research study that aims to improve our understanding of genetic and environmental contributions to human traits. They are enrolling public for purposes that promote human welfare through the advancement of scientific and medical discovery. The mission of the Personal Genome Project is to encourage the development of personal genomics technology and practices that: are effective, informative, and responsible; yield identifiable and improvable benefits at manageable levels of risk; and are broadly available for the good of the general public. To achieve this mission they are building a framework for prototyping and evaluating personal genomics technology and practices at increasing scales. Each year additional people are recruited to participate. A Series of articles written by Emily Singer for MIT's Technology Review detailing the rationale behind the Personal Genome Project, and how the project has grown tremendously during just the past few years.